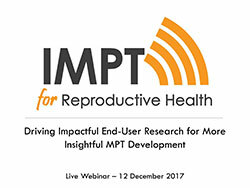 This live webinar aimed to engage new stakeholders brings experts together for a dynamic discussion of lessons from conducting end-user research in the fields of contraception, HIV, and MPTs to synthesize and share best practices for MPT product development and introduction. The webinar featured Anabel Gomez (AVAC), Amy Lin (USAID CII), Betsy Tolley (FHI 360), and Kate Guthrie (Brown University). Lin, A., Gomez, A., Guthrie, K., Tolley, B.